Video from the May 6 protest show protesters tossing a metal detector, breaking a window and ripping apart decorative iron work. San Francisco authorities are searching for protesters who caused more than $20,000 in damage at City Hall. 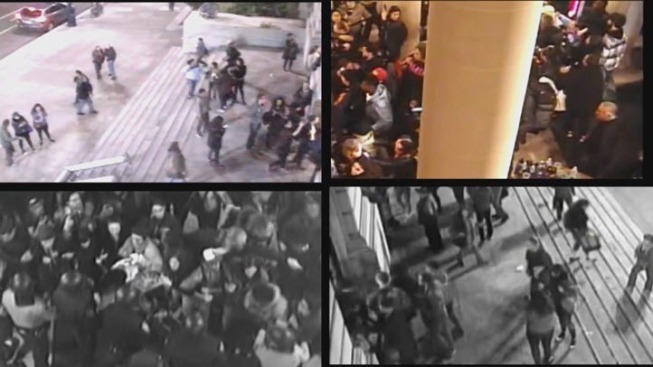 City Administrator Naomi Kelly on Tuesday released portions of security camera video during the protest in hopes of identifying the suspects. Video from the May 6 protest show protesters tossing a metal detector, breaking a window and ripping apart decorative iron work. "The tax payers shouldn't have to pay for this damage to a historic building," Kelly said. "This is the people place." Kelly said an ongoing investigation prevents her from releasing all of the video documenting the clash between Frisco 5 protesters and deputies in riot gear. Sanu Saleem also wants to share video she took while covering the protest for 48 Hills. Saleem and three other journalists have filed complaints with the San Francisco Sheriff's Department, claiming deputies used excessive force. "There came a point where he was pinning me against the desk with a baton," Saleem said. Saleem is hoping internal affairs is looking at deputy conduct on the security video. She believes change is in order. Deputies arrested 33 people during the protest. The Sheriff's Department said 20 of those arrested are San Francisco residents. The protest prompted security changes at City Hall, including deputies locking most doors at 5 p.m. instead of 8 p.m. In addition, big bags and backpacks must now go through City Hall's lone x-ray machine.